After talking about it in chat a little, I thought this would be a good idea! Just list, and describe, all of your past and present favorite pets! Paula and Sadie are my parent's cats, both are badly overweight. Paula is orange, Sadie's calico and very grouchy and shy. My dog is Belle, and she's the sweetest 14 year old puppy you'll ever meet. Poor girl lost her hearing a year or two ago, and I hardly ever see her since college. She's mid-sized, white, and has golden spots. Sweetest dog ever. And my parents have lots of other cats. Pedro, Napoleon, Kittum, and many many more interestingly named ones (courtesy my little sisters sense of humor). That's all for me! Let's share a little about ourselves! ***A second Gray tabby named Romulace. He is 2 years old. ***A white kitten named Bobsled because of his uncanny resemblace to snow. ( we lost him once to find him five minutes later about a foot away in the snow when he opened his bright blue eyes lol, he took a cat-nap in the snow) He is 5 months old. My second dog was a rottie named "Good Boy..."
My fourth dog was a Boxer named Fark. A female, at that. My sixth dog just left us...Allergy, Al for short, was 16 years of age, and as a german shepherd, anyone that knows dogs knows that is a long life for such a dog. Birds : A cockateal that belonged to my Aunt Karin, but lived in our house. She flew away after we owned her for about 7 months. ***A salamander of unknown species, which is about 7 inches long. I call him Blaze, and he's my favorite pet i have right now ^_^. but we have 2 water tortoises names Anne and Bart here. Currently own a Staffordshire Terrier/Whippet cross breed in our house and lets just say she is a handful :). Her name is Tessa (We just call her Tess for Shades reason of 1 syllable) and she is about 2 years old so still in her puppy stages. She is very loveable and loving although she does have her downsides. It is amusing when she acts like any creature other than a dog such as lying across the back of the sofa or on top of our outhouse and using her paws like hands when playing with toys. Her downside being the instinct of attacking smallish animals such as cats and rabbits coupled with her Houdini act of struggling out of collars and harnesses. Also being a rescue from a Dog's Home when the family playfight at home she drags our hands from each other using her jaws although her tail stays up and wagging so we don't need to worry too much :). Two cats we rescued as adults. Not as much want for adults cats as there is for kittens. Boopadoo is my sister-in-law's 4 year old Pomapoo. His real name is Corky Joseph, but when he bops into a room and prances around because he's just soooooo happy to see you, it's so adorable that you can't help but say "look at you, you little Boopadoo!". The name stuck. He's a little "kissy-boy" - he just loves to kiss "his people". And he does this thing where he hops around on his hind legs and bats at the other dogs with his front paws, like he's some kind of "Kung-Fu" master... He'll answer to "corky", "boops", "boopadoo", and if he hears "corky joseph! ", it's quite obvious that he knows he's been bad. Shade, I have to disagree... My cat, Lola, knows her name well, something I was ALWAYS skeptical of until I "tested" it. Lola gets agitated when her name is said. She feels she has to stand up and curve and mewl. Actually, Lola just gets agitated, all the time. That's why I have to beat her. I am mostly joking. So, I once stood far away while she was ensconced in window blinds looking out upon the glorious outside. I whispered "Lola". She instantly arose. This showed she could hear me and knew I was speaking her name from across two rooms. Stage 2: Instead of the very distinctive "Lo-la", I tried "Sha-Sha", "Na-Na", and "Ka-Ka". No response, she kept staring out the window. I then said "Lola" and she instantly rose and looked at me with the smoldering hatred that only she can muster. Stage 3: I tried "La-La". She didn't move. "Lola", up she comes. Now, I suppose I could try "Lo-Lo", and she would probably rise. But I don't think that is because of the first syllable issue: Lolo is just way too close to Lola (I don't expect a cat to know one vowel difference). 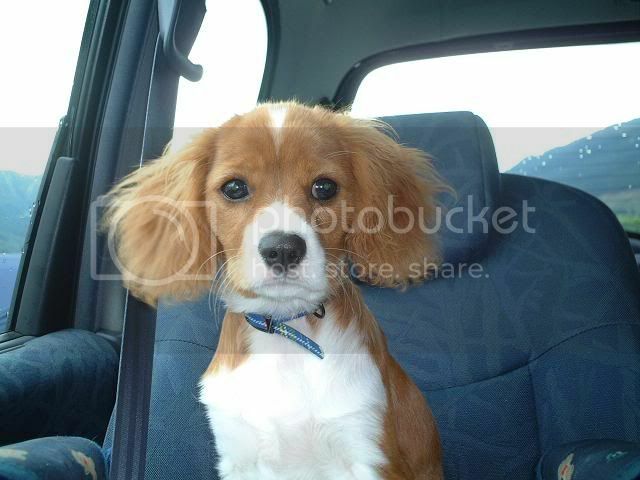 He's a bit older now but here's a picture of Basil our Cavalier King Charles Spaniel during a rainy car journey in Scotland. He's as daft as a dog can be, but then again what do you expect from an animal that was named by the CB1 community in a poll. Cats know their names. If they don't respond when you call them by anything else it is because you are daring to call them by anything else. My mum's cat is called Pimlico George and he answers to both with a disdainful yowl. But if you call him by his full name he prances along proudly. Remember we are cats' pets. Not the other way around. Hmmm, then cats are even a bit smarter than I thought they were. "Go get buddy ball" will send Regan off to look for, and return with, her glow-in-the-dark play ball. newest partially chewed rawhide and lie at my side, happily chomping away. excitedly bring it to me. Does "Go get me a beer" work? If it does can I insta my dog with your one please! All right I'll have a go cats(of course)name is blue or cat. Ok cat ,is a little free with the claws when you pet him and far to mouthy at times. But generally good for lapping up the odd petting or scratch. I've got a slim trim 7 animals in my house, and frighteningly enough, I think I own the greatest portion of them. of cats that people had left there thinking they'd be cared for (the mountain lions were the only ones "caring" for them), I met Violet my first day on the job I think. I lifted the lid on my very first dumpster run when a black streak with a silver band towards the front whizzed by my face, striking me dead from terror. Upon resurrection, I went over to examine what it was that had errupted so forcefully from the trash. I found a kitten so black she was purple, with an almost used up duct tape roll around her neck. some improvment in how she's doing. We are aiming to have her flying by this time next year. BTW Never EVER EVER get a cockatoo, not unless you've got the resources to care for an animal that one day may very well become nearly as needed as a special needs child. These birds are ill suited for captivity, and extremely sensitive to our horribly polluted homes. www.mytoos.com has a huge pile of information about these birds, and the trouble they are in because of us. Maggie likes tearing apart childrens blocks, sitting in our lemon tree, and flirting with boys.